They don’t really have a chance. Notre Dame’s Madison Cable drives past Miami’s Michelle Woods the ACC tournament in Greensboro, North Carolina, on March 5. As usual, the women’s NCAA Tournament this year is all about the University of Connecticut. Led by star forward Breanna Stewart, the Huskies are undefeated and chasing their fourth consecutive title, a feat that FiveThirtyEight’s tournament forecast gives them a whopping 71 percent chance of pulling off. That makes UConn a front-runner of colossal proportions; by comparison, you could combine the title probabilities for the seven most likely champions in our pre-tournament men’s forecast and still not match the Huskies’ odds. But despite their status as heavy favorites, the UConn women still have to play their games, and that means there’s room for the improbable to become reality. The other three top seeds in the tournament — Notre Dame, Baylor and South Carolina — have each lost only one game, and all three outscored their opponents by more than 15 points per game during the season. They don’t quite have the résumés of UConn, but they are very good teams. According to FiveThirtyEight’s model, those three teams and the University of Maryland — the No. 2 seed behind Notre Dame in the Lexington region — are the only non-UConn squads with a greater than 1 percent probability of winning the championship. The odds are slim, but let’s focus on the most likely candidates to do the unthinkable. Notre Dame’s strength lies in its backcourt, with ACC Tournament MVP Madison Cable leading the way at both ends of the court. Cable finished the season ranked third in the nation in 3-point percentage, at 47.6 percent, and she was the fourth-most-efficient offensive player in the country1 according to Synergy Sports Technology’s points per play metric. She’s also a ball-hawk on defense, averaging nearly two steals per game with a Synergy rating among the nation’s top 10 percent of individual defenders. And Cable isn’t the only two-way talent on this Irish roster. According to data from NCAA.com, only 52 players in Division I had an effective field goal percentage above 55 percent and a steal percentage above 3 percent this season; between Cable, freshman Marina Mabrey and reserve Hannah Huffman, the Irish have three of them in their backcourt. A proven formula for engineering upsets is maximizing possessions and making 3-pointers, and with Cable and company in the backcourt, the Irish seem to have that part of the equation down. Of course, UConn is on the opposite side of the bracket, so facing the Huskies would take getting through several other very good teams, particularly Maryland. Notre Dame has lost to UConn once this season, 91-81 in early December. But the Irish were missing their leading scorer and best frontcourt defender, Brianna Turner. With Turner back on the floor alongside Cable and that backcourt, the Irish might have a chance if they face UConn for the championship, which would be a rematch of last year’s title game. No one in women’s college basketball attempted more free throws than South Carolina this season — 770 total attempts, about 24.0 per game. The vast majority of those free throws were earned by the starting frontcourt, A’ja Wilson and Alaina Coates, who averaged a combined 28.0 points, 18.8 rebounds, and 4.4 blocks per game. At 6-foot-5 and 6-foot-4, respectively, the duo is big enough to match up with anyone, but the two players are skilled and versatile enough to exploit those matchups. However, the pair was badly outplayed in South Carolina’s loss to UConn last month. Wilson chipped in 13 points and 6 rebounds — both below her season averages — and Coates was dreadful, scoring 2 points on 1-for-6 shooting from the floor. That’s how the Huskies held a team that usually averages 89.6 points per 100 plays (14th-best in Division I) to a mere 76.1 in the 12-point defeat at home. If South Carolina is going to pose any threat to UConn in a rematch, it’ll need a lot more from Wilson and Coates. South Carolina will also need some support from its backcourt. No one on the team averaged more than 3.0 assists per game, and the Gamecocks had more turnovers than assists this season. The team only made 33.1 percent of its 3-pointers, 81st in the nation. Pounding the ball inside is South Carolina’s strength, but balance might be the key for the team to hit its ceiling if it gets another shot at the Huskies. Niya Johnson, Baylor’s point guard, may be the team’s most important player despite averaging just 7.1 points per game and rarely shooting any 3-pointers during the regular season.2 Such is the power of her playmaking: She averaged 8.7 assists per game, 1.4 more than any other player in the country, and was responsible for 26.1 points per game between her scoring and passing. Along with the slashing game of Nina Davis, Johnson’s skills as a facilitator have helped keep Baylor among the nation’s top five teams in field goal percentage this season. But as much as those two help keep the Baylor offense afloat, defense is what drives the team. Baylor allowed the nation’s third-fewest points per play during the season and ranked third-best in opponent field goal percentage, third in rebound margin and ninth in blocks per game. Baylor has the size to match up with anyone, including UConn, and the team’s plan will no doubt be to wear opponents down with its defense. The question, however, will be whether Baylor can score enough to make it work as the team gets deeper into the tournament. It had the country’s 18th-most efficient offense, and that may not be enough against a UConn defense so dominant that it finished the year with a per-play efficiency rate that was 3.4 standard deviations better than the Division I average. Maryland gave UConn one of its toughest challenges this season, losing by 10 points in a December game that was closer than the final score indicated. So it wouldn’t be a surprise to see Maryland keep things tight against the Huskies in a rematch, should the opportunity present itself. 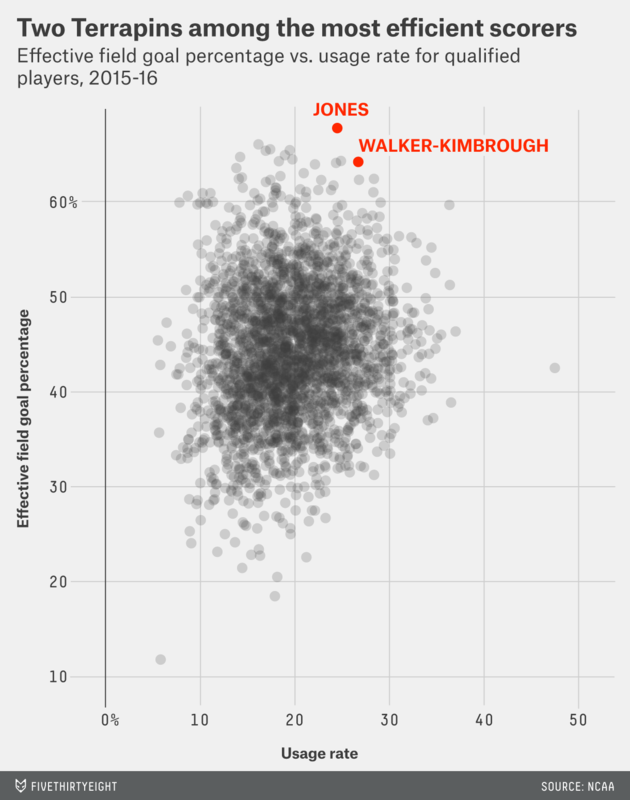 Driven by Jones and Walker-Kimbrough, Maryland had the fourth-most-efficient offense in the country according to Synergy, averaging 94.7 points per 100 plays. The only problem is that the duo doesn’t have a lot of help — during the season, only one other player on the roster made more than one 3-pointer per game, and no one else averaged double-digit shot attempts. So as Maryland moves through the tournament and considers the possibility of another matchup with UConn, the biggest question will be whether they can get some balanced scoring around their two stars. She attempted only nine threes all season long.